There's a whiff of the past in the Ravens' current playoff run. So said Kim Herring, strong safety on the Super Bowl XXXV championship team. Then as now, the Ravens rallied around linebacker Ray Lewis — but for different reasons. During the 2000 season, when Lewis was assailed publicly for his role in a double homicide, teammates embraced an us-versus-them mantra that fueled their title drive. Today, said Herring, the Ravens are playing inspired football because of Lewis' pending retirement. "The way Ray talks makes you want to run through a brick wall for this dude, even if you don't know why." 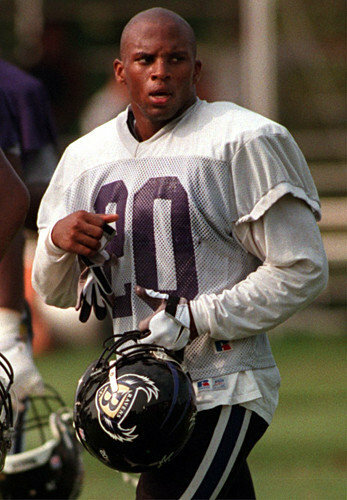 Herring, the Ravens' second-round draft pick in 1997, played four years in Baltimore and made the last one his best. He had 66 tackles and three interceptions in 2000, including a pick in the Super Bowl victory over the New York Giants. A sure tackler, he was a mainstay on special teams as well. "Coming from Penn State, I didn't miss many tackles," he said. "In college, if you had a bad game, [coach] Joe Paterno made you tackle the scout team's offensive linemen. He'd have them run full speed at us defensive backs. You either did it right or broke your neck." On the heels of the Ravens' championship, Herring — a free agent — signed with St. Louis and returned to the Super Bowl in 2001, where the Rams lost to the New England Patriots. Hence, his disdain for Baltimore's opponent on Sunday. "Give it to the Ravens, 27-24," he said of the AFC championship game. "If their kicker [Justin Tucker] can go to Denver and kick a long, winning field goal in one-degree weather, he should be able to do it at New England." Herring retired in 2005. The father of three, he lives in Orlando, Fla. where he runs an investment firm and, with his wife, Marissa, a fitness center for adults and high school athletes. In six years, "Garage Mama Fitness" has grown, literally, from a corner of the Herrings' three-car garage to a 7,000-square foot facility in nearby Winter Garden. At 37, he's still a trim 195 pounds. Last week, Herring joined a men's soccer league where guys his age play three-on-three on a full-sized field. One of his teammates is Johnny Damon, two-time baseball All-Star. "We run around, willy nilly, for two 20-minute halves," said Herring, whose team won its opener, 7-4. He is also a youth leader at his church, Orlando World Outreach, whose pastor, Tim Johnson, is a former NFL lineman who played for the 1992 Super Bowl champion Washington Redskins. "I really enjoy what I'm doing," he said of both the church work and fitness training of youngsters. "I feel like I'm helping them find an easier way to do things. Month by month, I see kids getting better physically, mentally and spiritually. And they're appreciative." Herring said he would watch the Ravens play Sunday night, save for another commitment. "My youth group is having a sleep-in at the church, and I have to be there," he said. "But there will be a lot of boys there, so I might be able to get a couple of televisions brought in — for the kids, of course. "Yeah, I might be able to finagle that one out."